“O god brahma, you are the creator of the framework of universe and the lord of all creatures… will you therefore relieve the earth of her prolonged burden? When the ocean was making a mess of that place with his water I angrily said to him "be quiet…"
He said "0h, lord, oh, god of gods, why imprecating a curse on me? I am an ardent follower of yours; I have been made by you and am always under thy protection like your son... what for you have cursed me in unbecoming words? How am I blameworthy, 0h, lord, if I am fidgety with rapidity of tidal surge according to calendric events…? Further, oh, lord, I am guilty as you say… but how is this River ganga culpable along with an inculpated one like me, and how justified is her going to earth along with a blemished one like me… won’t you show some mercy on her…” so said ocean-god to me.. There is problem with tense from now on. Sometimes it will be in present – adyApi; and sometime in past - AsIt rAjA; so everthing is brought to future tense for some readability. Let the forbearance of the bearer of all the worlds, namely earth, shall endure till such time… this is the method devised for the sake of elimination of self-limelighted kings…” So said brahma to ocean, ganga and other gods. niShThA = maraNam, who are scheduled to die soon. Banyan trees are Indian specific. Nobody grows in them in their courtyard or kitchen garden, because they uproot, strangle, and collapse that house. So also, each of the kings took birth has become up-rooter, strangler, and collapser of his own house under the ambit of bharata dynasty. Wikipedia has this info: The seeds germinate and send down roots towards the ground, and may envelope part of the host tree or building structure with their roots, giving them the casual name of "strangler fig". Older banyan trees are characterized by their aerial prop roots which grow into thick woody trunks which, with age, can become indistinguishable from the main trunk. Old trees can spread out laterally using these prop roots to cover a wide area. The largest such tree is now found in Kolkatta in India. This verse and some others will be in vein of some verses of vAlmIki rAmAyaNa. The above foots approximate with the verses said regarding the vAnarA-s, when they too took incarnation, in VRmn. 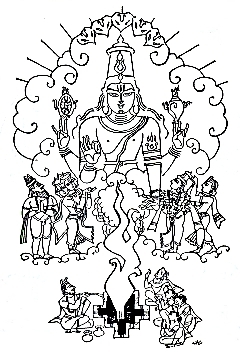 Thus, this is the fifty-third chapter of first canto called harivamsha-parva, in harivamsha-purANa, the sequel of mahAbhArata, narrating the prototypal incarnations of gods on earth.